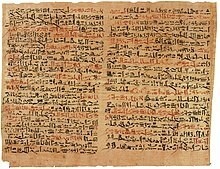 Plates vi & vii of the Edwin Smith Papyrus (around the 17th century BC), among the earliest medical guidelines. Modern clinical guidelines identify, summarize and evaluate the highest quality evidence and most current data about prevention, diagnosis, prognosis, therapy including dosage of medications, risk/benefit and cost-effectiveness. Then they define the most important questions related to clinical practice and identify all possible decision options and their outcomes. Some guidelines contain decision or computation algorithms to be followed. Thus, they integrate the identified decision points and respective courses of action with the clinical judgement and experience of practitioners. Many guidelines place the treatment alternatives into classes to help providers in deciding which treatment to use. ^ AGREE Collaboration (2003). "Development and validation of an international appraisal instrument for assessing the quality of clinical practice guidelines: the AGREE project". Qual Saf Health Care. 12 (1): 18–23. doi:10.1136/qhc.12.1.18. PMC 1743672. PMID 12571340. ^ Council of Europe. Developing a methodology for drawing up guidelines on best medical practice. Recommendation Rec(2001)13 and explanatory memorandum. Strasbourg: Council of Europe Publishing, 2002. ^ Haynes, Alex B.; Weiser, Thomas G.; Berry, William R.; Lipsitz, Stuart R.; Breizat, Abdel-Hadi S.; Dellinger, E. Patchen; Herbosa, Teodoro; Joseph, Sudhir; Kibatala, Pascience L.; Lapitan, Marie Carmela M.; Merry, Alan F.; Moorthy, Krishna; Reznick, Richard K.; Taylor, Bryce; Gawande, Atul A. (29 January 2009). "A Surgical Safety Checklist to Reduce Morbidity and Mortality in a Global Population". New England Journal of Medicine. 360 (5): 491–499. doi:10.1056/NEJMsa0810119. PMID 19144931. ^ Bergs, J.; Hellings, J.; Cleemput, I.; Zurel, Ö.; De Troyer, V.; Van Hiel, M.; Demeere, J.-L.; Claeys, D.; Vandijck, D. (February 2014). "Systematic review and meta-analysis of the effect of the World Health Organization surgical safety checklist on postoperative complications". British Journal of Surgery. 101 (3): 150–158. doi:10.1002/bjs.9381. PMID 24469615. ^ Shekelle PG; Ortiz E; Rhodes S; et al. (2001). "Validity of the Agency for Healthcare Research and Quality clinical practice guidelines: how quickly do guidelines become outdated?". JAMA. 286 (12): 1461–7. doi:10.1001/jama.286.12.1461. PMID 11572738. ^ Neuman MD; Goldstein JN; Cirullo MA; Schwartz JS (2014). "Durability of class I American College of Cardiology/American Heart Association clinical practice guideline recommendations". JAMA. 311 (20): 2092–100. doi:10.1001/jama.2014.4949. PMC 4346183. PMID 24867012. ^ Gina Kolata "Program Coaxes Hospitals to See Treatments Under Their Noses". The New York Times December 25, 2004. ^ Reames BN; Krell RW; Ponto SN; Wong SL (2013). "Critical evaluation of oncology clinical practice guidelines". J Clin Oncol. 31 (20): 2563–8. doi:10.1200/JCO.2012.46.8371. PMC 5073383. PMID 23752105. ^ Brito JP; Domecq JP; Murad MH; Guyatt GH; et al. (2013). "The Endocrine Society guidelines: when the confidence cart goes before the evidence horse". J Clin Endocrinol Metab. 98 (8): 3246–52. doi:10.1210/jc.2013-1814. PMID 23783104. ^ a b Siemieniuk RA, Agoritsas T, Macdonald H, Guyatt GH, Brandt L, Vandvik PO (2016). "TIntroduction to BMJ Rapid Recommendations". BMJ. 354: i5191. doi:10.1136/bmj.i5191. PMID 27680768. ^ Wilson W; Taubert KA; Gewitz M; et al. (October 2007). "Prevention of infective endocarditis: guidelines from the American Heart Association". Circulation. 116 (15): 1736–54. doi:10.1161/CIRCULATIONAHA.106.183095. PMID 17446442. ^ Vandvik PO, Otto CM, Siemieniuk RA, Bagur R, Guyatt GH, Lytvyn L, Whitlock R, Vartdal T, Brieger D, Aertgeerts B, Price S, Foroutan F, Shapiro M, Mertz R, Spencer FA (2016). "Transcatheter or surgical aortic valve replacement for patients with severe, symptomatic, aortic stenosis at low to intermediate surgical risk: a clinical practice guideline". BMJ. 354: i5085. doi:10.1136/bmj.i5085. PMID 27680583. This page was last edited on 10 February 2019, at 11:22 (UTC).